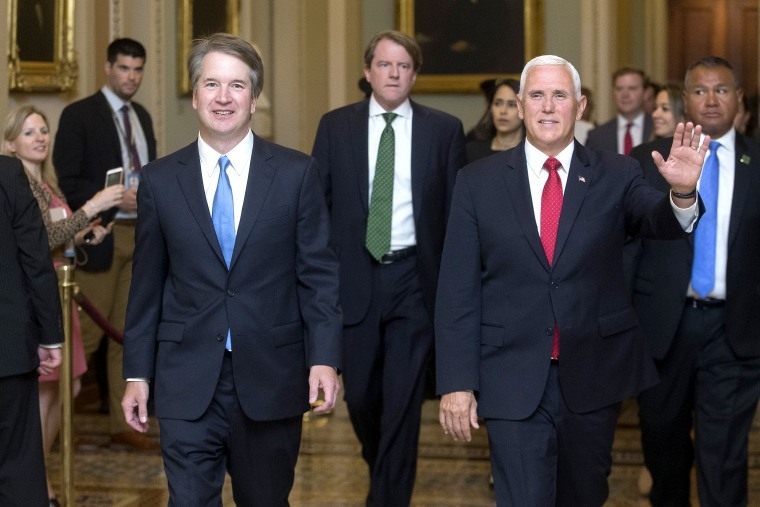 Supreme Court nominee Judge Brett Kavanaugh has written almost 300 opinions on a range of issues over his 12 years serving on the federal appellate court. In a 2015 case, Priests for Life v. HHS, the District of Columbia Circuit Court of Appeals refused to allow a rehearing for a religious group’s challenge to an Obamacare requirement that employers provide birth control to employees. Kavanaugh dissented from that decision. But breaking a little bit from some conservatives, he also argued that the government does have a compelling interest in facilitating access to contraception. In doing so, he followed the decision written by his mentor, Justice Anthony Kennedy, in the Hobby Lobby case. “In light of the numerous benefits that would follow from reducing the number of unintended pregnancies, it comes as no surprise that Justice Kennedy’s opinion expressly referred to a ‘compelling’ governmental interest in facilitating women’s access to contraception,” Kavanaugh wrote. In 2012, he wrote a decision rejecting the EPA’s effort to decrease pollution across state lines, arguing that the agency was exceeding its statutory authority. In the case, EME Homer City Generation v. EPA, Kavanaugh wrote that air pollution can affect both states where the pollution is emitted and other states that are downwind. Each state should have the right to regulate pollution on its own, he wrote. While the federal government sets air quality standards, he wrote, “the states have the primary responsibility for determining how to meet those standards and regulating sources within their borders.” This decision was later reversed by the Supreme Court. In 2011, Kavanaugh wrote a dissent when the D.C. Circuit Court upheld a series of bans on assault weapons in Washington. Kavanaugh argued that the city’s ban on semi-automatic rifles was unconstitutional because it made an artificial distinction between handguns, which were permitted, and semi-automatic rifles, which were not.